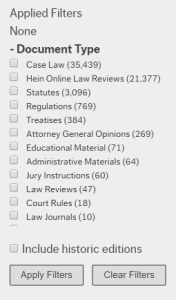 Ever typed a citation into the search function and wondered why you were getting cases instead of the statutes you were expecting? What about running a single search that returns both results that include regulations and caselaw interpreting those regulations? Simply click on “Advanced Search” and you will reach the Search Everything engine for Fastcase 7. Select any combination of caselaw, statutes, regulations, court rules, constitutions, secondary libraries, and more. Or you can simply search across all libraries and receive all possible relevant results for your search phrase. On the results screen, you can then narrow your search by filtering for specific documents. Simply click on the check box next to the document type you want and hit “Apply Filter” and your results will then be restricted to that one document type.